First appearing in 1929, The Adventures of Tintin began life as a series of comic strips written and drawn by Georges Rémi, better known by his pen name of Hergé. The subsequent Tintin books have been read and loved by countless generations of kids and adults, and the release of a 3D cinema film titled The Adventures of Tintin: Secret of the Unicorn directed by Steven Spielberg is eagerly anticipated by millions of fans all over the world. British film lovers will however, have to wait until 2012 for the UK premier. Plastoy, the French toy manufacturer has created a series of toy figurines to coincide with the launch of the film. These naturally include all the main characters of Tintin, Captain Haddock and Snowy with accessories such as an aeroplane and motorbike. An eclectic mix of static and action figures all feature in the collection. 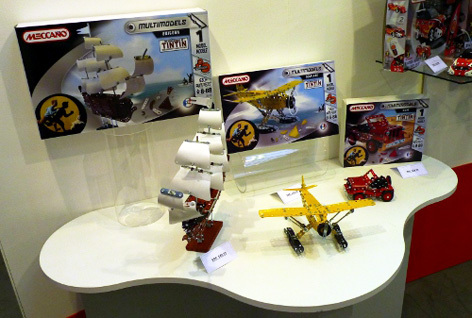 Excitingly, Meccano are also on board as a Tintin licensee, and a series of model sets feature vehicles, aeroplanes and ships from the film.